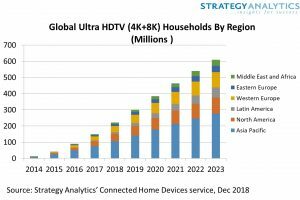 By the end of this year 222 million homes worldwide will own an Ultra HD TV, an increase of nearly 50% over the past twelve months, according to Strategy Analytics. The research firm’s ‘4K and 8K Ultra HD TV Global Market Forecast’ predicts that more than 600 million homes will own an Ultra HD TV by 2023 – though only 3% of these will be 8K-ready. The Asia Pacific Region is the largest market in terms of annual sales of Ultra HD TVs, with sales tipped to reach nearly 46 million units this year. However, North America is expected to continue to lead in adoption of Ultra HD TVs with 71% of homes expected to own one by 2023. Sales of 8K Ultra HD TVs are expected to reach more than 400,000 units in 2019 and more than 11 million by 2023. By 2023, 3.9% of Ultra HD TV homes in North America will own 8K displays, compared to 4.1% in Asia Pacific and 1.7% in Western Europe, according to the research. 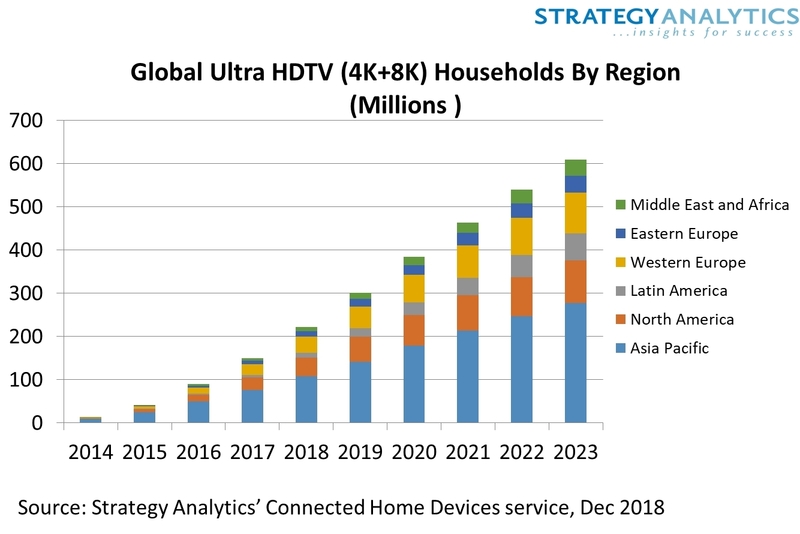 “The success of Ultra HD TV has been driven by technology adoption rather than content and services,” said David Mercer, principal analyst at Strategy Analytics and the report’s author. “4K video and TV services are now becoming more widely available, meeting the expectations of 4K Ultra HD TV owners for the best quality TV experience. Strategy Analytics director, David Watkins, added: “Owners of 8K TVs will primarily be watching 4K and HD content, while the TV’s image processors will do a good job of scaling most content to give impressive images.